Did you know crocodile skin shoes must be coloured and polished with great care since the leather is so delicate? Have you ever seen exactly how long it takes to meticulously engrave letters on glass, hand-paint porcelain or fix gemstones in an invisible setting? Did you know forty different skills go into creating a single watch? 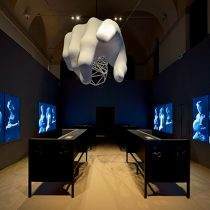 In this exhibit Homo Faber shines a spotlight on the human hands behind the brands, offering visitors an unprecedented opportunity to see master artisans from twenty European luxury houses at work. Watch as they demonstrate the rare techniques and exceptional skills used to create products of the highest quality. You’ll come away with an understanding of the true meaning of luxury – an embodiment of the skills, experience, passion and cultural traditions of European artisans par excellence.